Buyers can save more than $3 million by buying an apartment rather than a house in some of Melbourne's most exclusive suburbs. This apartment at 3/66 Mathura Road in Melbourne's exclusive Toorak is on the market for $850,000. If you're looking to buy into one of Melbourne’s top suburbs, you can save yourself more than $3.6 million by buying an apartment rather than a house, according to new REIV data. As of the December 2017 quarter, the median price of an apartment in Toorak was $940,000, while the median price for a house was $4.6 million - making a difference of nearly $3.7 million. 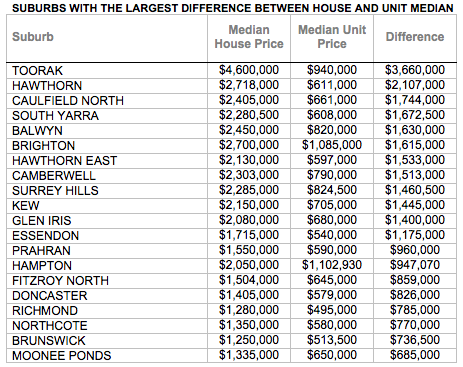 During the same period, the median price for an apartment in Hawthorn was $611,000, compared with a median for houses of $2.7 million - a difference of $2.1 million. Savings of more than one million dollars were also available for apartment buyers in Caulfield North, South Yarra, Brighton, Balwyn, Hawthorn East, Camberwell, Surrey Hills, Kew, Glen Iris, and Prahran. REIV President Richard Simpson said apartments remain relatively affordably, even in some of Melbourne's most exclusive suburbs. “Apartments and units are ideal for buyers who don’t want to compromise on location or amenities," he said. Simpson said apartments offer "an entry point to many of Melbourne’s most expensive suburbs." Though the capital growth for houses is generally higher than for apartments, the growing acceptance of apartments living is seeing apartment prices growth strongly too. “While apartments typically don’t see the same level of growth as houses, the apartment market performed strongly last year with double-digit price increases across the city," said Simpson. 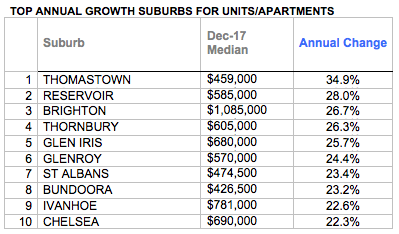 Simpson added that apartments were also delivering dividends for investors with strong capital gains being recorded in a number of inner and middle ring suburbs, including Thomastown, Reservoir and Thornbury. Please see Luxury List for apartments for sale in Melbourne. Please see The Home Page for apartments for sale in Melbourne.